This installation can easily and affordably transform any conventional showcase into an fully interactive screen. The video above demonstrates an "interactive-showcase" solution designed especially for bookstores. Any person passing by, can virtually open and read books by touching the showcase. Special care was given on the interface design, in order to be as natural as possible, with minimal and elegant aesthetics. Based on an idea of Leonidas Panopoulos, owner of the "Anima Libri" bookstore. 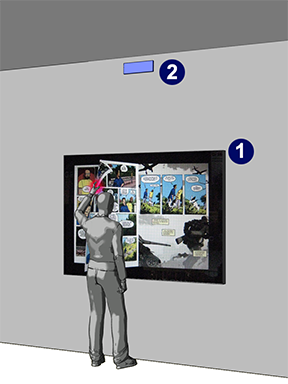 The installation components are shown in the image on the right: a computer (not shown) renders the animation in real time and presents it in a large monitor or a back-projected semitransparent film (1) behind the showcase. The visitor's touches are tracked by a kinect sensor (2) above the showcase. The simplicity and affordability of this interactive installation makes it ideal for various marketing solutions, as an impressive upgrade of conventional showcase.